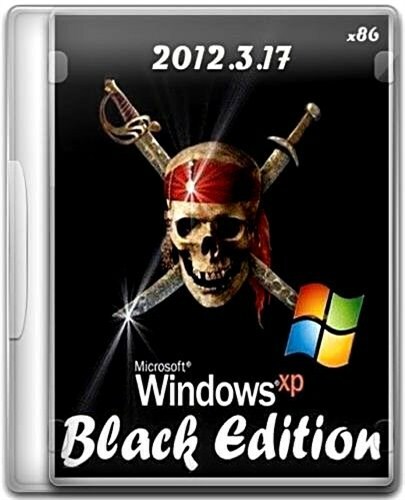 Windows® XP Pro SP3 Black Edition с автоматической установкой и обновлениями 15 марта 2012. Интегрированы все драйвера SATA/ACHI, LAN, WLAN и Chipset. Система полностью проходит проверку на валидность и может получать обновления с сайта Microsoft. * 7 new Windows XP Themes added: (ChaNinja Style RC5 v1.0), (Luna Element Black v5.1 + CSS), (Windows 7 Colors v1.0),(Disney - It's a Magical World v1.0), (BlackMesa v1.1), (NeoGeniX LS v1.0), (Royale Remixed v1.47). * A couple of new Web Links added to the Windows XP Favorites folder. * Key Changer (Keyfinder v1.51) to change the Windows XP CD-Key. * Text file with working WGA Keys that passes the Windows XP validation check. * MF4SBF Patch v2.0: Fixes the Windows XP slow boot bug which is caused by the "Microsoft .NET Framework NGEN v4.0.30319" Service. * TCP/IP Patch: Allows you to have 16777214 (Max) Half-Open TCP Connections instead of 10. * Uxtheme Patch: Allows you to use un-signed Custom visual styles. * SFC Patch: Allows you to disable and enable Windows File Protection with a registry key. * RAID-5 Patch: This will enable Software RAID-5 Support. * Suppressing Microsoft Update nagging to install Windows Genuine Advantage Notifications v1.9.40.0 (KB905474). * Suppressing Microsoft Update nagging to install Windows Malicious Software Removal Tool v4.6.6000 (KB890830). * Windows XP Service Pack 3 (KB936929). * Windows Internet Explorer 8. * Windows Media Player 11. * Microsoft European Union Expansion Font Update v1.2. * Microsoft XML Core Services v4.0 Service Pack 3 (KB973685). * Windows XP Root Certificates Update (KB931125) Version February 2012. * Windows XP CAPICOM v2102. * Microsoft Windows Update Web Control 7.4.7600.243. * Microsoft Update Catalog Web Control 7.4.7057.248. * Windows XP Powertoy - ClearType Tuner v1.01. * Windows XP Powertoy - Alt-Tab Replacement v1.0. * Windows User Profile Hive Cleanup Service v1.6g. * Microsoft BitLocker To Go Reader v1.0 (KB970401). * Windows Feature Pack for Storage v1.0 (KB952013). * Windows XP exFAT file system driver update package v1.0 (KB955704). * Windows XP GDI+ Detection Tool v1 (KB873374). * Windows XP QFEcheck v6.2.29.0. * Microsoft Windows Browser Choice (KB976002 v5). * Windows Genuine Advantage Validation v1.9.42.0 (KB892130) - Cracked Version. * Open Command Prompt Shell Extension v2.1.0. * HashCheck Shell Extension v2.1.11. K-Lite Mega Codec Pack v8.4.0. * Java SE Runtime Environment (JRE) v7 Update 3. * Flash Player ActiveX Control v11.1.102.63. * Microsoft Visual C-family (Up-to-Date) v1, v2, v3, v4, v5, v6, v7, v8, v9, v10. * Microsoft Visual Basic (Up-to-Date) v1, v2, v3, v4, v5, v6, v7+. * Мультимедиа: Images and Backgrounds, Movie Maker, Music Samples, Old CDPlayer and Sound Recorder. 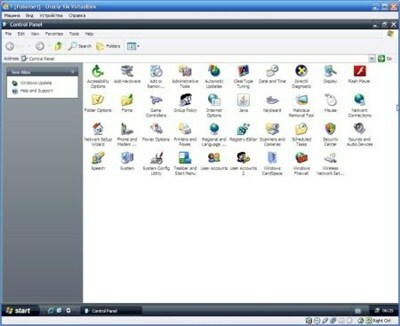 * Сеть: Communication tools, MSN Explorer, Netmeeting, Outlook Express, Windows Messenger. * Опции ОС: Blaster/Nachi removal tool, Desktop Cleanup Wizard, Out of Box Experience (OOBE), Tour, Zip Folders. * Драйвера: Display Adapters, IBM ThinkPad, Logitech WingMan, Microsoft SideWinder, Scanners, Serial Pen Tablet, Sony Jog Dial, Toshiba DVD decoder card. * Файлы: clock.avi, swtchbrd.bmp, yahoo.bmp. * Папки: "DOCS", "DOTNETFX", "SUPPORT", "VALUEADD", "I386WIN9XMIG", "I386WIN9XUPG". * Nothing has been removed that could cause any System Problems or any Problems with other Software Applications. * Обновлены DriverPack MassStorage form "v12.01" to "v12.03". * Обновлены DriverPack WLAN from "v11.09" to "v12.02". * Обновленный Flash Player ActiveX Control form "v11.1.102.62" to "v11.1.102.63". * Обновлен Microsoft Runtime Visual C-family v10. * Обновленный Windows XP Root Certificates Update (KB931125) from "Version November 2011" to "Version February 2012". * Обновлен Tweak "Suppressing Microsoft Update nagging to install Windows Malicious Software Removal Tool (KB890830)" from "v4.5.5900" to "v4.6.6000". * Интегрированы все Windows XP Service Pack 3 Updates form 15.2.2012 till 14.3.2012.